Professor Dr. phil. 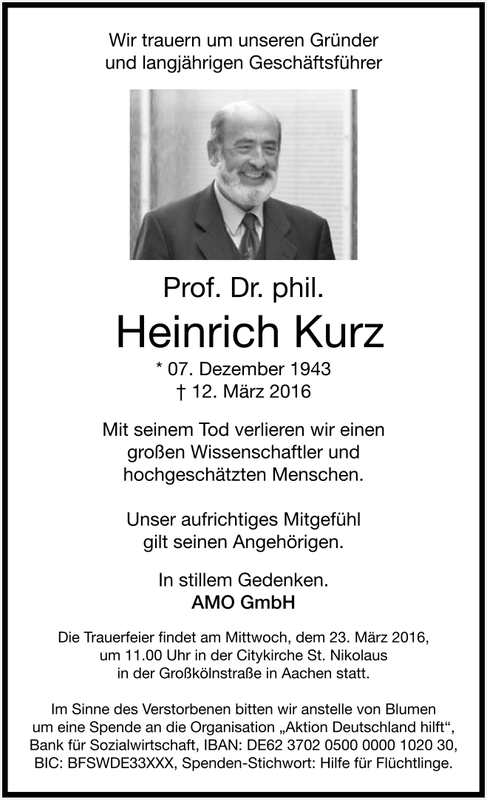 Heinrich Kurz unexpectedly passed away on the 12th of March at the age of 72. His many-sided scientific work distinguished him as a worldwide accredited scientist within the area of nanotechnology, optoelectronics and semiconductor physics. He shaped his scientific environment as a visionary and was both demanding and encouraging in research and teaching. He studied physics and mathematics at the University of Vienna, obtaining his doctoral degree in 1971. Subsequent to this, Professor Kurz worked for ten years at the Philips research laboratories in Hamburg in the field of optical bulk storage systems and optical storage materials. As Lynen fellow of the Alexander von Humboldt Foundation he worked as a research associate for Professor N. Bloembergen at Harvard University from 1981 to 1984. Habilitating in 1983 at the University of Hamburg, he became Professor at RWTH Aachen University in 1984 and leader of the laboratory of femtosecond spectroscopy on semiconductors. 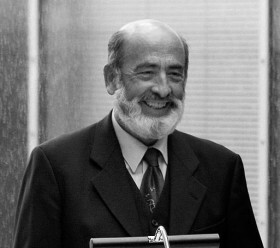 From 1990 to 2011 he headed the Institute of Semiconductor Electronics at RWTH Aachen University. Main focus of his research activities was on nanoelectronics. In 1993 he founded the nonprofit AMO GmbH for the advancement of transfer from science and research based on academic fundamental research into industrial application. With his death we lose a great scientist and highly appreciated person. 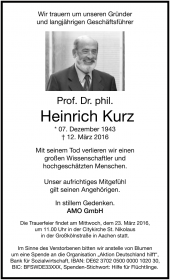 We sadly and deeply touched take leave of Professor Heinrich Kurz. His memento means honoring commitment for us. We would like to express our condolences to his relatives.